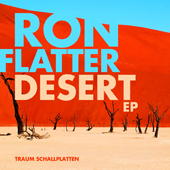 Ron Flatter’s previous Traum release the phenomenal "Mantequilla" ended up as an evergreen with many DJs. Ron has been under the radar for some time writing music and eventually came up with these two new originals, both sensual and melodic and he was excited to play them to us. Real played music with lots of passion… not so much deconstructed or manipulated but directly delivered… these two tracks have been rocking the DJs sets from Ron now for some time! For all of you who don't know him, Ron is a DJ icon in the east of Germany for now over 10 years playing all mayor festivals and clubs there. So now back to the music. The opening track "Desert" for us evokes comical sad moments of early Moby blended with techno beat dynamics to create a small hymn. There are some goose skin moments when the vocal hits in and you say to yourself: "this is perfect place to stay and remain for ever". "Stupid World" is in a way the flip side of the coin. It is not what you would expect after listening to "Desert", but it does connect. "Stupid World" has a stunning simplicity and lightness exercised to the point with a played piano melody and superb timed breaks that will put a smile on your face and lead you through the night. 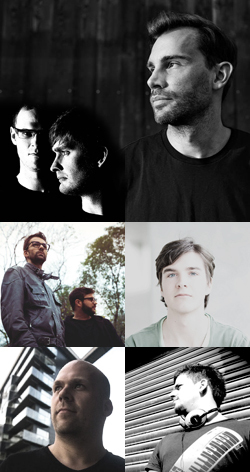 These tracks are rare to get these days so take a listen! Cosmic Cowboys "Mirage" remix of "Desert" begins with a monster of a grinding baseline mixed to the max teaming up with orchestral sounds in the background that seem to rise and fall, building up a cluster of sounds that come close to the best moments in Krautrock! Microtrauma have remixed "Desert" with a nice tripped out techno feel emphasizing those moments in between with refines and skill. The duo has been back with some mesmerizing music and this is part of it. Reinier Zonneveld impressed us so much with his tracks on Tour De Traum that we asked him to interpretate the original in his real-time-played fashion, that is so unpredictable and that has these incredible changes after the breaks introducing a new theme. This is another great one from him. Van Bonn has remixed "Desert" with his amazing dub techno feel. All is stripped down here and occasional spurts of sounds appear like comets that will vanish soon after they appeared. This is romance through repetition and a lot of anticipation of how sounds work. Indian producer Kohra has interpreted the remix with a lot of understatement though keeping the pop edge of "Desert" but adding some nice liquidity & lightness to it making it an after hour burner.